Silk threads- made of 100% pure and natural silk. The tensile strength and minimal stretch of the threads make them the ideal choice for stringing jewelry, especially pearls. 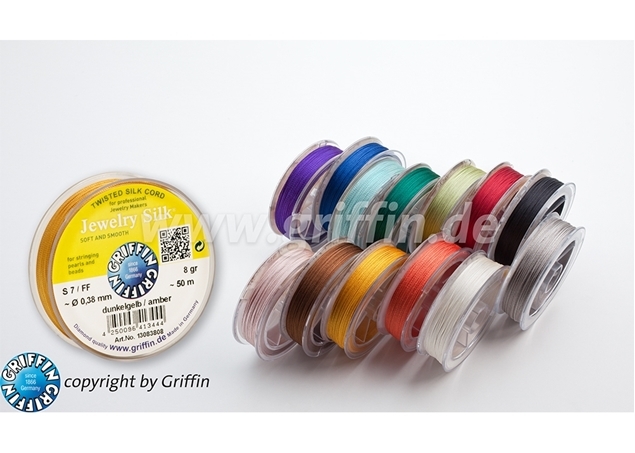 The threads are sold in packs of 8 grams in a variety of colors that include between 65 to 310 meters, depending on the diameter of the thread. Available diameters: 0.15mm-0.35mm. "Habotai" silk threads - 100% pure silk threads with a diameter of 3mm. Habotai silk is regarded as the most valuable silk due to its especially smooth and almost pure white thread. Habotai threads are so comfortable to wear that they are often referred to as the "second skin." Available in 20 different colors. Sold in units of 110cm.